This Treasury Management training course teaches you to effectively manage your liquidity, cash, foreign exchange and financial risk within a treasury function. Speaker demonstrated extensive knowledge in financial instruments covered and risk management techniques. Excellent presentation, very knowledgeable & extensive experience. Yes, this course has "exceeded" my expectations. Understood the fundamentals of financial instruments and their uses in the industry. *OPTIONAL: CTS ™ Exam (via Online): Certification exam is optional. Only if you want to get certified do you need to take the exam. Duration: 90 minutes. Who should attend this Treasury Management training course? You should have a basic understanding of financial markets and products. You will need to bring a laptop computer with you for exercises and computer simulations. 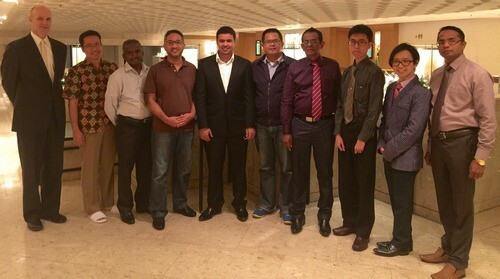 “Speaker demonstrated extensive knowledge in financial instruments covered and risk management techniques. 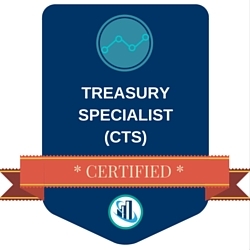 This digital badge designates you as a Certified Treasury Specialist (CTS)™, which you may use on business cards, resumes, LinkedIn profiles, website profiles, email signatures and more. In addition to the Certificate of Completion for the course in general, if you successfully pass the Certification exam, you also receive a digital printable CTS™ Certificate to mark your achievement. As part of your successful certification, you also receive a full year's access to the EH Brain Trust Membership to help you keep up-to-date on the industry issues. In order to keep your status as a CTS in good standing, you need to regularly take Continuing Professional Development courses.